The National Association of Student Financial Aid Administrators (NASFA) held its annual conference in New Orleans last July, and members discussed the federal student loan program. According to Inside Higher Education, NAFSA members listened to a panel of experts speak on the topic and then cast their ballots. "A majority of attendees voted to say that student loan debt, while perhaps problematic, was not of crisis proportion" (Stratford, 2015). And of course for the NAFSA members, the student loan program is not in crisis. After all, they all have jobs, the colleges are getting their tuition money, and the federal government shows no inclination toward shutting off the spigot of student-loan money. Someday the party will come to an end, but the NAFSA people are hoping the federal student-loan program won't collapse until after they retire. Michael Stratford, Student debt protesters crash annual gathering of college financial aid officers. Inside Higher Education, July 21, 2015. When I was young, car buying was a very stressful experience. In the old days, car buyers were always at a disadvantage. They didn't actually know the fair price of 1962 Ford Fairlane, and they didn't know how much other people were paying for them. Thus car buying involved tense negotiations, urgent consultations between car salespeople and their supervisors, and sweaty car buyers sitting in showrooms wondering if they were about to pay too much. And sure enough, right after you drove your shining new Plymouth Fury home and parked it proudly in the driveway, your neighbor came over to tell you that his brother-in-law got the same model for a hundred bucks less and the dealer threw in whitewall tires for free. How much is this beauty really worth? Today, car buyers have a lot more information about car prices, thanks to websites like Edmunds.com. But families are much in the same position as car buyers in the 1960s when they shop for a college. They really don't know what the fair price of a college education is, and they don't know what other families are paying. And colleges, just like 1960s car dealers, do all they can to obscure the fair price of a college education. For example, Utica College in central New York and Rosemont College in Pennsylvania recently slashed their tuition prices drastically. Utica cut its tution from $35,466 to $20,000--a 42 percent price reduction. Rosemont dropped its tuition price from $46,000 ($46,000!) to $30,000--a discount of more than 30 percent. Wow! Prices Slashed! Everything Must Go! What a lucky break for college students and their families. Just like the end-of-the-year sale at the Chevy dealer. But wait. According to Inside Higher Education, very few Utica and Rosemont students were actually paying the full cost of tuition. At Utica, only 271 out of 2,300 students were paying the sticker price. And at Rosemont, only 9 out of 1,100 students were paying full tuition--less than 1 percent! Rosemont and Utica, like most American colleges and universities, are engaging in differential pricing. They set a very high sticker price, hoping a few suckers will pay it; and then they offer steep discounts to the students they really want to attract--minorities, students with high SAT scores, athletes, legacies, etc. In fact, nationwide, the average tuition price at private schools is about half of the posted tuition. Of course, all businesses adjust their prices somewhat to attract buyers at various income levels. That's the way business has been done since the beginning of time. But American colleges have taken differential pricing so far that they've tarnished their integrity. How can a college honestly say that its tuition price is $46,000 when less than one percent of its students actually pays that price? The hocus pocus about college tuition prices is part of the general confusion about college costs. The FAFSA form for financial aid is unintelligible, tuition varies from student to student, and the student-loan process is so complicated that many students don't know how much money they borrowed, how much they still owe, or whether their loan is a federal loan or the loan from a private lender. But that's the way the colleges like it. Keep 'em confused. And if a customer asks too many difficult questions, throw in a set of whitewall tires to seal the deal. 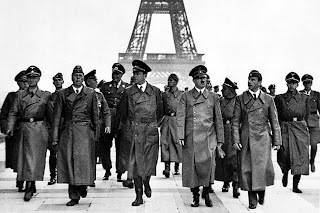 My brother-in-law told me you'd give me a really good deal . . . .
And then the Germans invaded the Low Countries and within a month the Nazis were in Paris. When the party's over, it's over. American higher education, it seems to me, is behaving much as the Parisians did on the eve of their World War II disaster. Tuition goes up every year, even though the colleges offer steeper and steeper discounts just to lure students in the door. The average freshman now pays just 50 percent of a college's sticker price. Meanwhile, the major public institutions of the South and Midwest pay their varsity football coaches $4 million and even $5 million a year to producing winning teams; and the assistant coaches often make a million dollars a year or more. The campus book stores sell fewer and fewer books but make a profit selling junk. Fewer books means more space to sell college-branded t-shirts, sunglasses, and coffee mugs at outrageous prices. Most campuses now have a Starbuck, where students can buy elaborate coffee drinks for $5 a pop. More and more, colleges and universities are outsourcing their student services. University employees no longer cook the meals. Let them eat at Taco Bell, conveniently located in the Student Union. As a percentage of total college enrollment, fewer and fewer undergraduates live in college dorms. Instead they flock to expensive, privately developed coed student-housing ghettos that provide undergraduates with swimming pools, game rooms, and plenty of space to park their late-model cars. And why not? Student loans will pay for just about everything. And if the kids need more money than they can borrow on their own account, mom and pop will be glad to co-sign student loans at private banks. Total outstanding student-loan debt is now $1.3 trillion. But it can't go on forever. Almost 7 million people are currently in default on their loans, which means they haven't made a student-loan payment for more than a year. Millions more have obtained economic hardship deferments and aren't making student-loan payments. More and more people have signed up for income-based repayment payment plans that stretch out the loan repayment period to as long as 25 years--3.9 million people, according to the Department of Education. That's a 56 percent surge in just one year. DOE describes the uptick in long-term repayment plans as a victory because students' monthly payments go down. But many people in these plans are making payments so low they will never pay off their loans. And anyway, who wants to pay a percentage of their income for a quarter of a century just for the privilege of getting a crummy college education? Nor is it clear that most people will stick with a long-term payment plan for 25 years. Not long ago, DOE reported that more than half of the people in those plans failed to report their annual income, a prerequisite for continuing in an income-based repayment program. This house of cards is about to come tumbling down. Already, private liberal arts colleges are folding or on the verge of folding as students realize that it makes no sense to pay $40,000 or $50,000 a year to attend a nondescript private liberal arts college in nowheresville. Sweetbriar's debacle is just the first of many more college closings to come. And the bloom is off the rose for the for-profits, which have been insanely profitable for the private equity groups and wealthy investors who own them. Corinthian Colleges' bankruptcy is but the harbinger of a major shakeup in the for-profit college industry. And what happens to Corinthians's 300,000 former students, most of whom used student-loan money to pay their tuition? How many Corinthian alums will pay back their student loans? 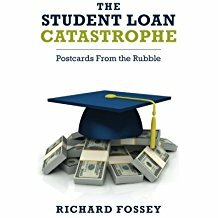 There's only one solution to this giant economic disaster--reasonable access to bankruptcy for overburdened student-loan debtors. 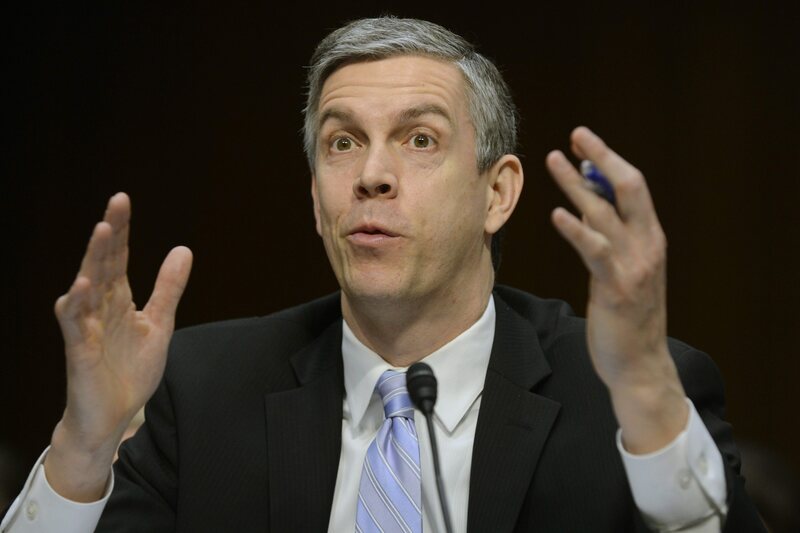 But DOE and its loan-collection agencies fight student-loan bankruptcies tooth-and-nail. DOE even opposed bankruptcy relief for a quadriplegic debtor who was working full time but couldn't make enough money to compensate his full-time caregiver and and still pay his fundamental living expenses (Myhre v. U.S. Department of Education, 2013). DOE knows that if bankruptcy relief becomes an option for people who are swamped by their student loans that a flood of debtors will flow into the bankruptcy courts. If that ever happens, this enormous fraud on American young people will be exposed. So colleges and universities waddle long, academic year after academic year, jacking up their tuition and hiring more and more bureaucrats and administrators. College presidents hob nob with wealthy donors and watch the football games in executive sky boxes. Tenured professors teach less and less, and low-paid adjuncts teach more and more of the college curriculum. But the metaphorical equivalent of German panzer tanks are hiding in the shrubbery of our well-groomed college campuses. And some day soon, American higher education--the envy of the world our college leaders tirelessly assure us--will collapse. Mitchell, Josh. School-Loan Reckoning. 7 Million Are In Default. Wall Street Journal, August 21, 2015. Shirer, William. The Collapse of the Third Republic. New York: Simon and Schuster, 1969.